Colonial breeder. Builds a tree nest during the dry season in which 2 or 3 eggs are laid. Found in Sub-Saharan Africa in both wet and arid habitats. Often lives near human habitation and refuse. Freshly caught diet during mating season consists of termites, fish, frogs, small mammals, young crocodiles and flamingoes. Mainly carrion and human waste during the rest of the year. 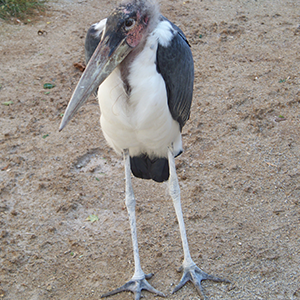 Large, upright standing stork with a bare face and neck, with a tuft of white plumage 'hair'. They have black wings, dorsal body, and legs, with white ventral plumage. The straight bill is approximately 12 in. long. These birds have no voice box, and therefore are mute. They communicate by clattering their bills loudly.